My Amazing Cloth - Clean any hard surface using only water! My Amazing Cloth: Clean any hard surface using only water! 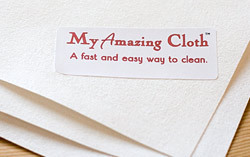 My Amazing Cloth is an exciting way to clean almost any hard surface. Just wash using only water. Surface will dry sparkling clean without wiping dry. Buy one today and see for yourself! Also works well with tech products like laptops and the iPad™! Dries sparkling clean WITHOUT wiping dry! This cloth will last for years... a fast and easy way to clean. Increase quantity in next step. | Pay with PayPal or credit card. My Amazing Cloth is approximately 15"×15". 70% Polyester, 30% Nylon. Made in U.S.A.